Classic Kitchens & Interiors designed the kitchen for this upside-down Nantucket home, where the main living spaces are on the second floor. 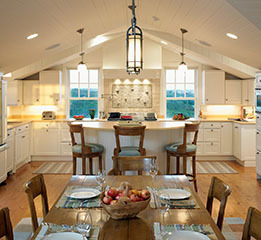 The ceiling slopes in these second-floor spaces add to the intimate cottage feel, as does the white painted cabinetry. The island is positioned to catch glimpses of the ocean over the landscape.